When we moved to Saratoga Springs in early July, I had no intention of making serious training a priority. I joined running and swimming groups, of course, but only to make friends, not to get fast or go far. Saratoga had other plans for me, and my first run with the Saratoga Stryders was a speed workout in the woods on July 17, a steamy Wednesday night. I’ve made almost every other Wednesday night workout since then, and have run hills, a track workout, a tempo run and an interval run—a total of five speed workouts. That’s five more speed workouts than I’d done … well, in a very long time. I’ve also been doing long runs on Saturdays with the Stryders, working up to nine miles this past week. The nine-miler was a complete accident, courtesy of the guilt I felt about abandoning the gal I’ve been running with, who is training for a marathon, on the rest of her 18-miler. 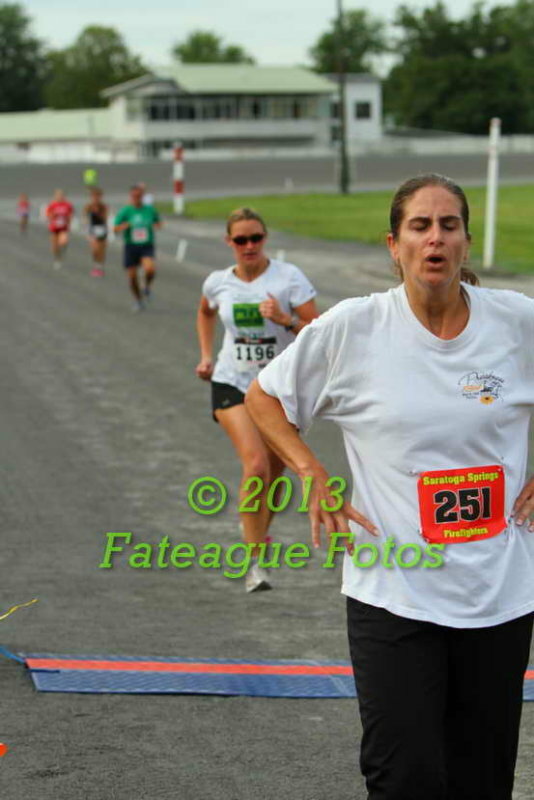 I’ve been doing the occasional Monday night race—the Monday Night Mile and the Camp Saratoga 5K Trail Fun Run. Me running the Monday Night Mile. No, I have not been working on my form. Why do you ask? Photo credit: Brian Teague of Fateague Fotos. The answer to that question is 29:18. It’s possible this is my slowest-ever 5K time, but given the exhaustion I felt during the race and the soreness I felt in the days that followed, you would’ve thought I had set a new course record. I had aimed to run a fast-but-steady first mile, then hold that pace to the finish. I succeeded in running that fast-but-steady pace the first mile. But by mile No. 2, my quads were absolutely trashed from the rolling hills, and by Mile No. 3, I was walking the downhills, afraid I’d take a tumble (it’s all fun and games until someone trips on a root and falls on her face). Still, the beautiful course and the camaraderie of my fellow runners (lots of words of encouragement by people passing me on the hills) made it a great event. RACE NO. 2, Aug. 19: I had a simple process-based goal: Avoid the mistake I made last time, and keep enough gas in the tank to tackle those late hills. Somehow, I still ended up with a fast-but-steady first mile and pain and absurdity in the second and third miles. At the starting line, I felt excited to run a strong, steady race. I found the gals in my Wednesday-night pace group in the crowd, and tried to stay on their heels. I lost sight of them by the second mile, and by the end of the race, my main goal was not getting trampled on the downhills, which I again walked. I felt too wiped to manage anything but a spirited jog to the finish. I expected my time to be the same. To my surprise, I ran 27:46—still not speedy by most standards, but more than a minute faster than the last time I ran a painful, uneven race on the same course. Progress! THE TAKEAWAY: I left the race last night feeling grateful for my fellow runners, who again cheered for me as if I was getting ready to set a new course record, and grateful for being able to take part in such a lovely, low-key event. It costs $5 per race for members of the Saratoga Stryders; timing and placing is done via popsicle sticks; and there’s watermelon and cake post-race. Who could want anything more? Gotta love seeing progress that quickly. Kudos to you Amy, and it makes me so happy to hear how you’ve already found your place in your new home.